Deric's MindBlog: A bit of science fiction...a brain implant that allows mind-controlled gene expression. A bit of science fiction...a brain implant that allows mind-controlled gene expression. 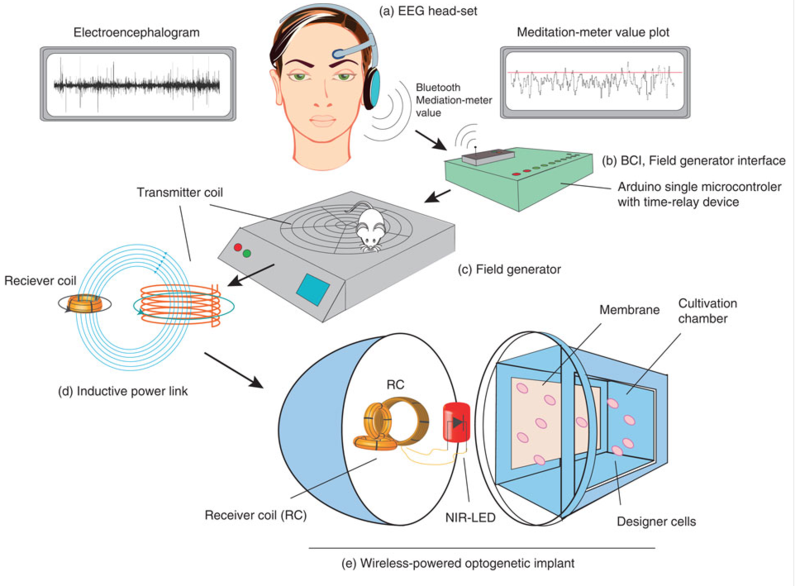 The mind-controlled transgene expression device consisted of (a) an EEG headset that captured brain-wave activities (the encephalogram), identified mental state-specific electrical patterns (biofeedback, concentration, meditation) and processed discrete meditation-meter values (0–100; meditation-meter value plot), which were transmitted via Bluetooth to (b) the Arduino single-board microcontroller with a time-relay device and switching the (c) field generator ON and OFF. This BCI (a–c) controlled (d) the TC (c,d) of the field generator, which inductively coupled with the (d,e) receiver coil (RC) of the (e) wireless-powered optogenetic implant. (e) The NIR light LED illuminated the culture chamber of the wireless-powered optogenetic implant and programmed the designer cells to produce ​SEAP, which diffused through the semi-permeable membrane. The blood ​SEAP (human ​secreted alkaline phosphatase) levels of mice with subcutaneous wireless-powered optogenetic implants containing designer cells that were freely moving on the field generator could be modulated by the human subject’s mindset in a wireless, remote-controlled manner. The science is a bit complex for me. I had to read this entry a couple of times to grasp a basic understanding of it but I think it's a pretty intriguing concept. I like to write sci-fi and it really is a promising notion.